not just a company goal – it’s a mandate. To underscore the importance of safety, Slifco Electric, LLC has developed and maintains an extensive Company Safety Program and enforces strict compliance with our safety policy. Slifco Electric is 100% committed to the successful implementation and continuous improvement of our Company Safety Program, which has been designed through a cooperative effort on behalf of every employee and customer of Slifco Electric. Furthermore, to provide our customers with a safe job site and to ensure the safety of our employees, we annually invest in the best equipment and training available. 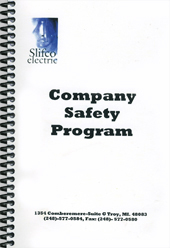 Every Slifco Electric employee is required to attend our Safety Orientation Program and receives a copy of the Company Safety Program Manual as well as job-specific safety training. Slifco Electric recognizes the high degree of importance put on safety by all of our clients. All local MIOSHA, OSHA and federal safety requirements must be followed at all times. Slifco Electric maintains an active company safety committee that consists of office and field personnel who are involved in monitoring our programs in an effort to improve our safety policies and procedures. Our safety committee has found that quality safety training and thorough investigation of incidences and near misses help to reduce the number of injuries encountered company-wide. We also have a full-time safety coordinator on staff who takes pride in attending all safety meetings and maintains open communications with our customers and employees. In addition, the company has safety representatives at each job site to address daily safety issues. In fact, our safety program and on-site safety efforts have been recognized by many of our clients and are significant factors in the high productivity of our employees and in our clients' selection of Slifco Electric as their electrical contractor of choice. But don’t take our word for it. See for yourself what our clients have to say about the Slifco Electric Safety Program – Slifco Electric Safety Testimonials .